Last week scientists, including those from the Scott Polar Research Institute, identified a major error in the press release accompanying the publication of the latest 13th edition of the Times Comprehensive Atlas of the World. HarperCollins, the Atlas's publishers, claimed that Greenland had lost 15% of permanent ice compared to their map from 1999. They claimed 300,000 square kilometres of ice had been lost, an area the size of the United Kingdom and Ireland. The Cambridge scientists alerted the UK media to this error, and their international colleagues did likewise to global news networks. Scientists around the world discussed the error openly via the e-mail discussion forum, Cryolist. SPRI scientists are pleased to see that a spokesperson for HarperCollins has retracted the 15% claim, "We came to these statistics by comparing the extent of the ice cap between the 10th and 13th editions (1999 vs 2011) of the atlas.... This was done without consulting the scientific community and was incorrect. We apologize for this and will seek the advice of scientists on any future public statements." But scientists remain troubled by the final statement in the latest press release from HarperCollins, "We stand by the accuracy of the maps in this and all other editions of The Times Atlas". Scientists still contend that the latest map of Greenland is highly misleading and is not a proper map of the ice extent and topography. The map shows only the extent of ice greater than 500m thick (furthermore, it appears to show contours of Ice Thickness rather than Surface Elevation). All permanent ice cover less than 500m thick has simply been erased. As far as the UK scientists are aware, Greenland is the only map that does not show the topography and extent of ice correctly. The maps of Antarctica, Iceland and European Alps all appear to look sensible. If HarperCollins had applied their "greater than 500m ice thickness rule" to other areas of the globe, there would be virtually no glaciers mapped in Iceland or the Alps. The scientists urge HarperCollins to acknowledge that their mapping of Greenland's ice is incomplete and misleading. 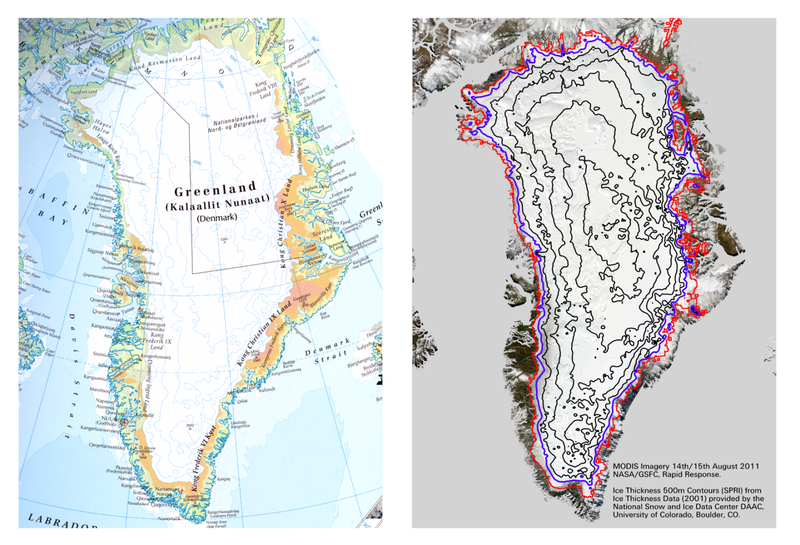 We would encourage them to issue a corrected map for Greenland which shows the full ice extent and the true surface topography. The current map is in marked contrast to the overall quality and authoritative nature of the rest of the Atlas. The Figure shows the new Times Atlas map (left) together with a mosaic of two satellite images taken in August 2011 (right). Also on the right are contours of ice thickness shown every 500m. The blue line is the 500m ice thickness contour which is the same as the outline on the Times Map. The red line is the 0m ice thickness contour which would be a better representation of the ice sheet than the blue line. The Times Map excludes all the ice between the red and blue lines. Furthermore, it excludes all the ice caps and glaciers that are not part of the main ice sheet, visible on the satellite image but not shown on the map.